A new study suggests that Campi Flegrei, a volcano in the metropolitan area of Naples, one of the most densely inhabited areas in the world, may be near a critical pressure point which would reawaken it from its, almost 500 years long, sleep. In the course of a new research, the Italian and French scientists for the first time managed to identify a threshold for the rising magma under the surface of the Earth. After the threshold is passed, the rising magma body might induce the release of volcanic gasses and fluids at a ten times larger rate. When the volcano reawakens, the magmas rising through the shallow crust have to pass through hydrothermal fluids and rocks. Because the mechanisms of interaction of magmas with hydrothermal fluids are still fairly unknown, the ability to interpret monitoring signals and hazard assessments have been limited. The researchers have used the results of physical and volatile saturation models to demonstrate how magmatic volatiles, released by decompressing magmas at a critical degassing pressure (CDP) are capable of driving volcanic unrest toward a critical state. The study suggests the magma of the Campi Flegrei volcano could be approaching a critical degassing pressure, at which the released magmatic volatiles are capable of pushing the volcanic unrest to a critical state. The process of releasing the fluids and gasses would inject steam of high temperatures into the surrounding rocks: "Hydrothermal rocks, if heated, can ultimately lose their mechanical resistance, causing an acceleration towards critical conditions," explained Giovanni Chiodini, lead author of the study and a researcher at Italy's National Institute of Geophysics and Volcanology in Bologna. If such a situation were to unfold, it would be extremely dangerous for the people residing near the caldera of the volcano. At present, the scientists can't say if, or when, this might occur. The Campi Flegrei volcano has been undergoing uplifts since 2005, and the ground deformation and seismic activity of low-level have reportedly increased recently. The local officials raised the alert level from green to yellow in 2012, prompting the scientists to closely monitor the situation. The caldera of the volcano was formed about 39 000 years ago, in the strongest eruption which happened on the grounds of Europe over the last 200 000 years. The last eruption from the volcano occurred in 1538. Campi Flegrei is a large 13-km-wide caldera on the outskirts of Naples that contains numerous phreatic tuff rings and pyroclastic cones. The caldera margins are poorly defined, and on the south lie beneath the Gulf of Pozzuoli. Episodes of dramatic uplift and subsidence within the dominantly trachytic caldera have occurred since Roman times. The earliest known eruptive products are dated 47000 yrs BP. 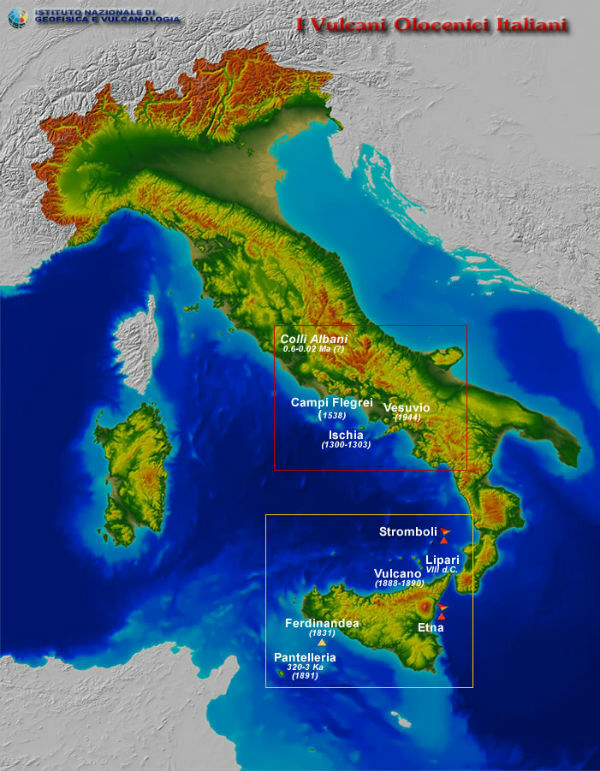 The caldera formed following two large explosive eruptions, the massive Campanian ignimbrite about 36,000 BP, and the >40 cu km Neapolitan Yellow Tuff (NYT) about 15000 BP. Following eruption of the NYT a large number of eruptions have taken place from widely scattered subaerial and submarine vents. Most activity occurred during three intervals: 15000 - 9500, 8600 - 8200, and 4800 - 3800 BP. Two eruptions have occurred in historical time, one in 1158 at Solfatara and the other in 1538 that formed the Monte Nuovo cinder cone.